Army imagery of Project Horizon, the Army’s proposed base on the moon. “ … a lunar outpost … is of critical importance to the U.S. Army of the future.” It was March 1959, and Army Lt. Gen. Arthur G. Trudeau, the author of those words, was tasking the Army’s chief of ordnance to develop a proposal for a “manned lunar outpost” that would “protect potential United States interests on the moon.” The story behind this secret study (called “Project Horizon”) and the plan to have an Army base on the moon by 1966, is the story of a great idea whose time has never come. When Trudeau wrote the ordnance chief, it was less than a year after the Soviets had shocked America and the West with the launch of the Sputnik satellite. With the United States now clearly behind in the so-called “Space Race” with the Soviets, it should come as no surprise that Trudeau and other senior Army leaders were thinking about a military presence in outer space in general – and on the moon in particular. In fact, according to a 118-page monograph produced by the Army in June 1959, “to be second to the Soviet Union in establishing an outpost on the moon would be disastrous to our nation’s prestige and in turn to our democratic philosophy.” Since the Soviet Union had already claimed that its citizens – and presumably the Red Army – would be on the moon in 1967, it was urgent for the United States to get there first. The Army concluded that seventy-five Saturn II rocket launches could be achieved by the end of 1964 – with forty of these launches needed to put sufficient Project Horizon equipment into orbit for the lunar base’s construction. 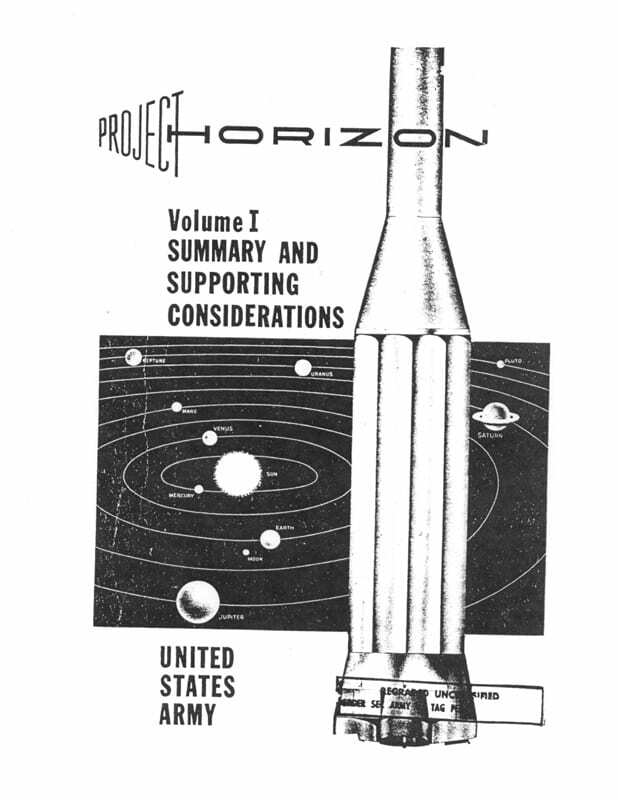 Cover sheet of the Project Horizon proposal. Note the illustration of the Saturn II that the Army planned to employ in building and supplying the moonbase. The Army insisted that there were no known technical barriers to establishing a manned lunar base and believed that Project Horizon “should be a special project having authority and priority similar to the Manhattan Project in World War II.” After all, if America had built the atomic bomb, there was no reason that it could not put a handful of soldiers on the moon. Project Horizon contemplated using the multistage Saturn II rocket, then under actual development, and intermediate orbiting space stations (then only on drawing boards) to ferry construction materials to the moon. The Army concluded that seventy-five Saturn II rocket launches could be achieved by the end of 1964 – with forty of these launches needed to put sufficient Project Horizon equipment into orbit for the lunar base’s construction. As for the base itself, the scientists and technicians who took part in Project Horizon suggested that natural “holes” or “caves” could be covered and sealed with pressure bags to create living space on the moon. This sort of construction also had the attraction of lessening the danger from meteorites and alleviating temperature extremes on the lunar surface. 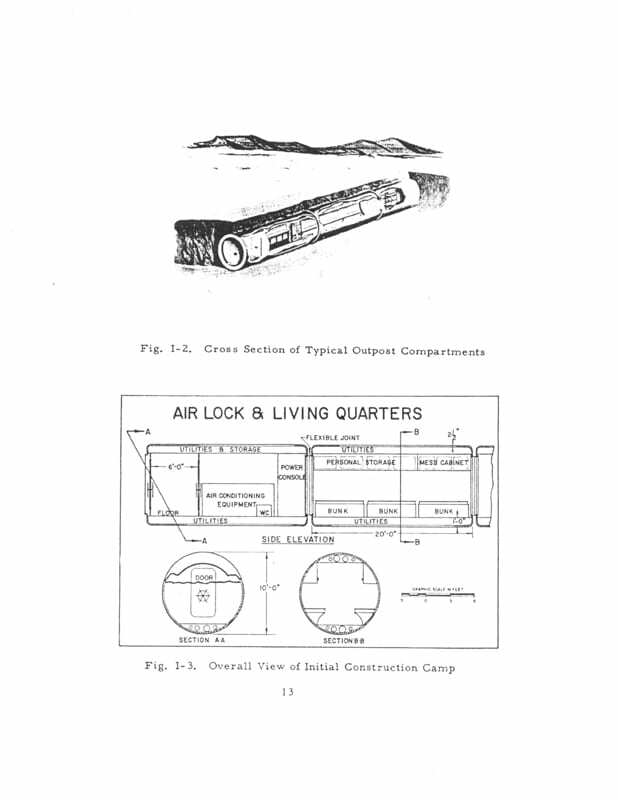 Drawings in the Army study also show a buried cylindrical structure that included living quarters – and an airlock to the surface. As for power, it would be provided by solar or nuclear energy. Oxygen and water could be extracted from the natural environment of the moon. Military personnel stationed on the moon would wear space suits and carry special weapons and equipment developed expressly for moon-use. The proponents of Project Horizon argued that America’s ultimate goal on the moon should be to deploy moon-based weapons systems. Why? Because moon-based military power would be a strong deterrent to war since an enemy would have great difficulty in preventing U.S. retaliation. The Army also proposed that a “unified space command” be created to control the lunar base and “that portion of outer space encompassing the earth and the moon.” There seems little doubt that the Army leaders who pushed Project Horizon saw an Army general as the perfect choice to lead such a unified command. A page from the Project Horizon proposal, detailing plans for layout and living quarters. A Manhattan Project-scale effort might have worked, but it would have required a huge increase in the U.S. government’s expenditures on defense and, as the alarm over Sputnik dissipated, there seems to have been diminishing political interest in funding a military base on the moon. The Army officers working on Project Horizon concluded that the United States could establish “an operations lunar outpost by late 1966,” assuming that “initial manned landings” took place in the spring of 1965. So what happened to Project Horizon, and the Army’s plan to have a manned lunar outpost? First of all, the technological challenges were more difficult than the authors of Project Horizon had thought – and also considerably more expensive. A Manhattan Project-scale effort might have worked, but it would have required a huge increase in the U.S. government’s expenditures on defense and, as the alarm over Sputnik dissipated, there seems to have been diminishing political interest in funding a military base on the moon. Second, the expansion of the war in Vietnam also siphoned off energy – and money – that might have gone to Project Horizon. Finally, and most importantly, any future American military presence on the moon became an impossibility when the United States, Soviet Union and United Kingdom signed an outer space treaty in 1967. Known formally as the “Treaty on Principles Governing the Activities of States in the Exploration and Use of Outer Space, including the Moon and Other Celestial Bodies,” this international agreement limited the use of the moon to peaceful purposes. In short, the militarization of the moon was no longer an option – and remains an impossibility since this international treaty is still in effect. It took until 1969 before a man – astronaut Neil Armstrong – would take a giant leap for mankind on the surface of the moon, but there is still no base of any kind there. While Project Horizon is largely forgotten today, it remains a great idea whose time simply never came. Camp Century, under the Greenland Ice Pack, was a nuclear powered, earthbound prototype for this proposed moon base. It was certainly an era when there was both will and wallet to try things. The reactor I think would definitely have been a part of any moonbase. The other option, solar, just wasn’t mature enough to provide the kind of power they would need. This article is inaccurate because Project Horizon has been on the moon since 1959. They get their water from.a well. The fleet of military ships that travel to the moon base from military bases and named the Aurora Fleet. The event in Aurora Colorado occurred July 20, 2012 the Apollo 11 landed July 20, 1969. Flight 93 landed in Cleveland Ohio September 11, 2001 and passengers exited the plane and entered the NASA Glenn Research hanger were they were interviewed by the FBI. They were then loaded onto buses and removed from the airport property. Robert Mueller was director of the FBI that day. Mueller is still director of the FBI. Cleveland mayor Michael White’s press conference that day was broadcasted one time on WCPO a Cincinnati t.v. station. I was told by Mary Liken-Stout assistant to the general manager of the station that they will not rebroadcast the mayors press conference. Mayor White owns the Yellow Butterfly Winery in Ohio now. Dr. Bill Deagle and Philip Corso Jr. told me about Project Horizon. Dr. Deagle worked at US Space Command and he said the Air Force guys told him. Phil Corso’s father was Chief of Army Foreign Technology desk from 1960-1963. I met Phil’s son Andrew Corso last year in Port St. Lucie Florida where they own High Speed Composites. The base has computer chip manufacturing, nano diamond mining and helium 3 mining. Kevin demonstrates for us the tragedy of untreated schizophrenia. Or, in laymen’s terms: he’s a raving funcing nutjob.